MONDAY, Jan. 15, 2018 (HealthDay News) — Do you often feel grumpy at work? Sometimes a small change in your surroundings can have a big effect on your mood. According to a study in the Journal of Experimental Psychology: Applied, having some greenery in your office space can make you both happier and more productive. British and Dutch researchers decided to challenge the business concept that stresses minimal office decor and clean desks. 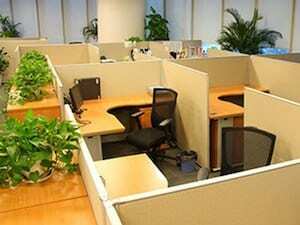 They did a number of experiments in large commercial offices to compare the impact of lean offices to “green” offices. In all cases, they found that having office plants created a better work environment. One possible explanation is that greenery increases engagement by making people more physically, cognitively and emotionally involved in their jobs. Plants offer health benefits, too, because they act as natural air filters — important if your work area has stale air or common pollutants. You don’t need a bright window — or any window for that matter — to have a mood-boosting plant at your desk. Many species thrive in low light and with little effort. Peace lilies, ferns, palms, mother-in-law’s tongue and some philodendrons do especially well. Pothos plants don’t even need soil — just put a few leafy clippings in a vase filled with water and enjoy. Whatever your choice, be sure to follow the grower’s directions so your plant does well, especially on weekends or whenever the office is empty. Colorado State University has tips on indoor plants and light that apply to most office spaces, regardless of climate.